The weekend just wasn't long enough, was it? I can't believe it's already Monday! We spent our weekend with friends - enjoying sushi... and not-so-much enjoying Cowboys & Aliens. Seriously - worst way to spend $19. 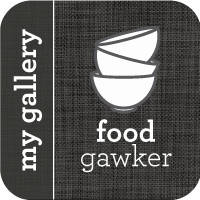 But this isn't a movie blog, it's a food blog. 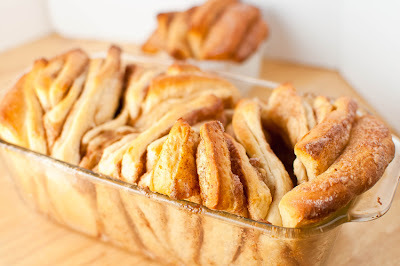 And I thought I'd share with you the winner of the last bi-weekly poll - Cinnamon Pull-Apart Bread. It's nothing new. Tons of bloggers have done it. But this last week was my first experience with it - and judging from the positive reaction of my co-workers and Andy - it won't be my last! So here's to starting the week on a sweet note! In a large bowl, combine 2 cups flour, sugar, yeast, and salt. In a small bowl, whisk the eggs. In another small bowl, melt 4 tablespoons of butter with milk. Add water and vanilla and stir until combined. Pour milk mixture into bowl with flour. Add eggs and stir until incorporated. Add remaining flour, in 1/2 cup increments, until a ball of dough forms. The dough should be somewhat sticky, but capable of holding shape. Knead dough on a floured work surface for about 10 minutes. Grease a large bowl and place dough inside. Cover and let rise in a warm place for about 1 hour. Deflate dough and knead on a floured work surface for a couple of minutes. Roll dough out to 1/4 to 1/2 inch thickness (you should get a large rectangle - about 12x20). To make filling, melt remaining 4 tablespoons of butter. In a separate small bowl, combine sugar, cinnamon, and nutmeg. Brush the butter onto the rectangle of dough and sprinkle cinnamon-sugar mixture over top. Using a pizza cutter, slice the dough into 1 to 1 & 1/2 inch strips. Then cut across to make squares. Stack dough in groups of 6's (I had 8 stacks). Grease and flour a loaf pan and place as may stacks as possible (I fit about 6 stacks). I had 2 leftover stacks that I just put it individual ramekins. Cover with a kitchen towel and let rest for about 30 minutes. Bake bread for 30 minutes, or until golden brown (If you do individual ramekins, decrease time about 5-8 minutes). Let bread rest for 20 minutes before digging in. This was definitely some really good bread! Not to mention it looks stunning! I think there was the perfect ratio of cinnamon to sugar, and I just couldn't stop eating it. The individual portions were gone within an hour - and it took a lot of will power not to devour the loaf pan that I was taking to work! That looks addictive good! Have seen quite a few pull apart breads online. Yours looks great! I would have zero self control with this. This looks so delicious. I will need to give this a try soon. Yummy! Oh yum. Those are almost too gorgeous to eat. Almost. Looks delicious, haven't try this bread. Oh man that looks AMAZING!! I have seen it around and always promising myself I will. After seeing yours, I am convinced, but will wait to share it when the kids come to visit. The pull-apart factor makes it all the more fun to eat! First, this looks amazing! Second, thanks for stopping my blog and leaving a comment. I can't wait to read about your culinary school adventures. I was signed up to start Baking and Pastry Arts right after my first daughter was born. Then they had to cancel the night/weekend courses that semester because of low numbers. Since then I've had my second daughter and am just too chicken to make the jump and try to go that route again. Maybe once the girls are a little older. Good luck! Wow, your pull apart bread turned out astounding!! Pull apart bread in a ramekin sounds so creative. And these looks just perfect! I keep seeing this bread but I don't dare make it for fear of how much I would eat! I love that you made little ones in ramekins! I love anything that is individually served! 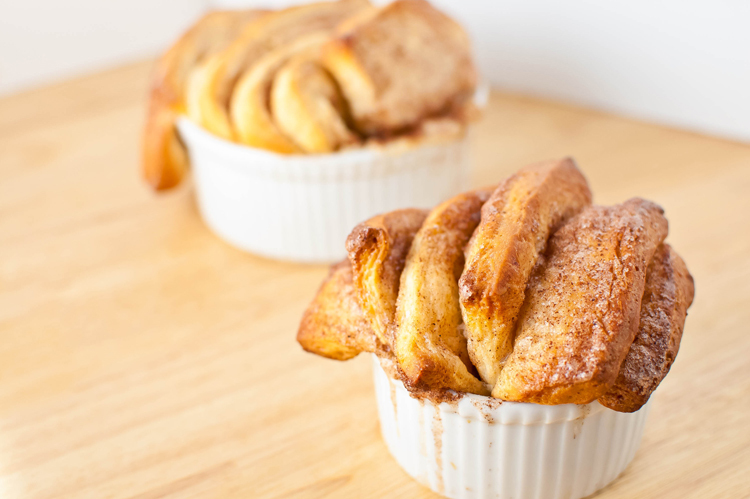 Cinnamon is a huge hit at this house, love this recipe! Totally agree that bread baking can be super-addictive! This is a superb recipe. I will be happy eating these bread...yum! 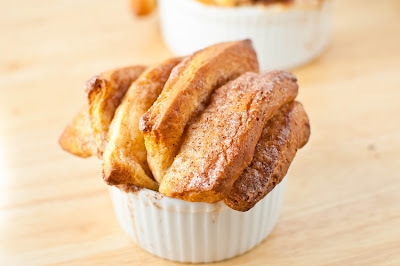 Pull-apart bread has had a huge insurgence in the blogosphere lately. I STILL haven't gotten around to it, but every time I see it, I wonder why I haven't, haha. Glad you had a nice weekend (other than the crappy movie, haha). Oh this sounds and looks just so delicious! I love bread like this and this is a recipe that I want to try soon! Thanks for sharing!! This is just like the "monkey bread" my mom used to make for us on special occasions! We thought she was a culinary genius, taking Pilsbury crescent-roll dough, rolling it up, piling it together in a Bundt pan, dousing it with cinnamon, and sugar and baking it until the house smelled warm and intoxicating. Mmm... warm, toasty, cinnamony, sugary… heaven. I've been dying to try this bread. Yours looks fantastic! This bread looks so good and if you ever need a guinea pig, shout me a holla! LOL! I was wondering if that movie was any good. It didn't seem like it would be based on he previews. Very well done Peggy! I have had my eye on this since I saw it the first time. Yours is beautiful. I really need to make this, everyone seems to love it! Delicious! I love bread, I love cinnamon! Unfortunately, I'm allergic to cinnamon, but I picked it, too....it's too delicious not to see it made! Yummy! I know everyone is making this kind of bread, but I haven't gotten around to making it either :) You've done a fabulous job! Looks really good! Especially the small ones in the ramekins. They are adorable! This looks way too delicious to pass on! I've made a similar recipe with a savory monkey bread but I am loving the texture of this pull apart bread! I'm going to give it a try. New follower. I love the pics on your header. This recipe is mouth watering good. Looks so good. My daughter would go crazy for this. Thanks for the heads up on that movie, was considering seeing it. We saw Planet of the Apes and loved it. I have seen this all over the blogosphere but never made it myself. I love cinnamon and yours looks amazing! have to agree with you, it looks really really good! this is my first time at your blog and i really like it. and i'mr eally jealous of the fact that you're going to culinary school after you finish your degree! i wish i could.. maybe if i save up and if i convince my dad not to axe me after that. Ive loved every single post ive seen for the pull-apart breads out there, but never have i seen it done in dinky little ramekins, such a cute idea for the leftovers :) Really gorgeous bread indeed, talented baker you! Cinnamon into baking is so great, I simply love the smell and taste, lovely outcome. Honestly, I dream about this bread. Amazing. I like home made breads and home made aroma is so good yummm:). This looks super delicious!! I'm never make before. I tell you, I always see this on blogs and it makes me drool every single time! Yours is NO exception. Stunning photos and the cinnamony goodness is just popping from my computer screen. Well done! I love that you used little ramekins for some of the bread. I'm sure it tastes as good as it looks! Oh my goodness gracious! That is gorgeous. I bet it is so delicious! aw man! I've just established that I am NOT doing anymore baking for the next couple weeks (except the cookies I owe a co-worker today) - it's becoming a habit! And now you, just stroll in here, with your pull apart cinnamon bread?? Who do you think you are, lady?! PS. Looks delicious. Side note: I have SUCH an issue with Cowboys and Aliens! While it looks super exciting and I guess it's based off some comic book... How more racist and colonizing can a film get?! It's the wild west and all the native americans are erased (the ones that do make it into the film are either very "white" or stereotypically "indian") however in their place is the "alien" race who takes their women and children (because the two can be collapsed as the same: helpless), and their only hope of salvation is the white man - in this case, daniel craigs and harrison ford. Good LORD! Sorry... rant over. Definitely the more I keep seeing this bread pop on blogs, the more I want to make it. Looks so irresistible with that sugar coating and all those lovely layers. I keep seeing this blogs on every blog I visit. Just haven't had time to make it myself... And now the more i see it the more I want to make it. Great blog. good movies are few and far between; however, cinnamon pull apart is always a winner and yours looks perfect. Peggy, your pull apart bread looks wonderful, specially with lots of cinnamon. I still have to try to make a pull apart bread. I've seen this yummy pull apart bread on a few blogs. Would love this yummy bread with my morning coffee! This looks so good, and so fun to eat!! This is so fun to look at and to eat. On my to do lst next! So yummy. I have such a cinnamon craving going these days. The little ramekins are too cute. Thanks for stopping by to comment on my blog :) That bread looks absolutely luscious, I can already imagine it warm and fragrant from the oven. Oh my goodness, this looks super fabulous. I love those little ramekins! Why is everything cuter when it's miniature?! Have you ever tried making different variations? Maybe cream cheese and lemon? Wow, this looks delish! I think I will make it for my daughter this weekend!